A major fire has destroyed the roof of Notre-Dame cathedral in Paris, toppling its spire and leaving the remaining structure of the building in a weakened state. 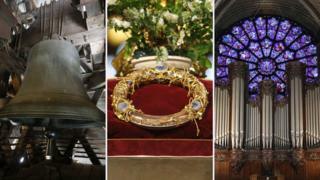 France's culture minister Franck Riester said the "most precious treasures" have been saved, including what is said to be the crown of thorns worn by Jesus and the tunic of Saint Louis. The emergency services worked late into Monday night to salvage the art and other priceless pieces stored in the cathedral. The wooden interior has been destroyed. The cathedral has three rose windows dating back to the 13th Century, which are among its most famous features. André Finot, cathedral spokesman, told BFMTV that the rose windows appeared not to have been touched by the fire, although there were still fears for them because of the fragility of the building. And Alixe Bovey, a medieval art historian from the Courtauld Institute of Art in London, told BBC Radio Wales that "much more of [the glass] has survived than looked even remotely possible in the first few hours of the fire". She added that they "look more than salvageable" and "in really remarkable condition considering what they've been exposed to". The cathedral has 10 bells - the largest, known as Emmanuel, weighs more than 23 tonnes and was installed in the south tower in 1685. His main character, Quasimodo, is feared by locals for the way he looks - but finds sanctuary in the cathedral and is employed as a bell-ringer. Notre-Dame is home to relics from the Passion of Christ, described as a piece of the cross, a nail and the Holy Crown of Thorns, said to have been worn by Jesus before the crucifixion. Anne Hidalgo, mayor of Paris, tweeted that firefighters, police and others formed a human chain to rescue priceless artefacts, such as the crown and tunic said to have been worn by King Louis IX when he brought the crown of thorns to Paris. BBC Europe correspondent Kevin Connolly said firefighters reported that some of the large paintings inside the cathedral were too heavy to take down from the walls and save. Some of the art and artefacts were stored overnight in City Hall but they would be moved to the Louvre museum as soon as possible, said French culture minister Franck Riester. Major paintings in the cathedral would be moved to the museum on Friday, after they had been protected, conserved and restored, he said. Mr Riester said they were mostly undamaged but may have suffered some effects from the smoke. Many of the cathedral's important artefacts - including paintings, sculptures and textiles - were held in its many chapels around the nave. These being relatively safe, Ms Bovey told the BBC, is thanks to the cathedral's stone vaults being "more or less sound" after the blaze - something that didn't look likely when it first started. "What can happen in fires like this is that they burn so hot that the stone vaults can fail, and then the fire can fall through into the body of the church and scorch the limestone," she said. But, she said, that doesn't appear to have happened. "I feel pretty optimistic looking at the external fabric that [the artefacts are] more than salvageable". The cathedral has three organs, including the 8,000-pipe Great Organ, first constructed in 1401 and rebuilt in the 18th and 19th Centuries. Despite many restorations and additions over the years, it still contains some pipes first installed in the medieval era. Deputy Mayor Emmanuel Gregoire told French news channel BFMTV that the organ remained intact. Organist Johann Vexo, who was playing a Mass when the fire alarm rang, told BBC Radio 4's Today programme: "It's the most famous instrument in the world. It was absolutely stunning, gorgeous - we don't have any words to describe it, it was a wonderful experience every time. It was such a privilege to work and to play in this wonderful place." Anyone feeling fit enough to climb the stairs and gain views across Paris has to pass another of the cathedral's best-known features - the gargoyles and grotesques. These are two types of stone sculptures, often featuring mythical creatures. Unlike grotesques, gargoyles have water spouts to carry rainwater off the building, although several have already been replaced by PVC pipes because Notre-Dame's stonework has corroded. The most famous sculpture - known as the Stryge - sits on top of the building, watching out over the city with its head in its hands. Notre-Dame's famous spire, which collapsed during Monday's fire, dates back to the 12th Century. It underwent several changes in the building's history - including being dismantled during the French Revolution, and later rebuilt in the 1860s. Reflecting on its collapse, the Royal Institute of British Architects said: "The loss of the roof and spire of Notre-Dame, and possibly the stone vault too, is an irreplaceable blow to the heritage of French Gothic architecture. Work on the western facade began in 1200, but the first tower - the north one - was not completed until 40 years later. Officials said that both bell towers remain intact.